When the Christmas tree spontaneously combusts, Granny goes for a dive on the ice or your 2-year-old niece swallows that intricate ornament, you dial 911 and trust that experts are on the way to save the day. Unlike many rural areas, the cities of the Wood River Valley are blessed to have a cadre of highly trained firefighters and emergency medical responders on hand to help its citizens in their hours of need. What many people don't know is that a large percentage of those men and women who rush to every emergency are not full-time firefighters, but paid-on-call volunteers. At Christmastime, they drop their (virgin) eggnog, stuff their party dresses into their turnouts (protective coat and trousers) and leave their families surrounded by unopened presents as they rush out the door to help make sure everyone's holiday season ends with a smile. Every year, to honor those who take time out of their lives to help those in need, the valley's fire departments select one individual from their volunteer corps to recognize as their Firefighter of the Year. A peer-based award, it's determined from a vote among the volunteers. This year the special Firefighter of the Year helmets that each department gives to its winner were presented at the departments' Christmas parties. Scott Miley, a 20 year volunteer for Hailey Fire Department, was awarded Firefighter of the Year by his peers Wednesday night at the department's Christmas Party, held at Sweetwater Grange in Hailey. He was also recognized for his 20 years of service, and his years of dedication to the city will be acknowledged at a City Council meeting in January. "He is a Hailey native and runs his own business—Scott Miley Roofing," said Robin Warner, the department's administrative assistant. "He's a very integral part of the community." 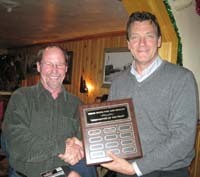 Mike Witthar, a volunteer since 2005, received the Ketchum Fire Department's highest accolade for its volunteer corps. A squad leader and advanced emergency medical technician, Witthar is a state-certified Firefighter 1, a vehicle extrication instructor, a CPR instructor and a nationally red-carded strike team leader. "He's dedicated a lot of time and effort towards this department," said Ketchum Fire Chief Mike Elle. "It's greatly appreciated. He's earned this award for going above and beyond the call of duty. The dedication and commitment of all our volunteers to providing emergency services at all times of day or night, leaving their warm home and families, is truly awesome." Taan Robrahn, a four-year volunteer and graduate of Wood River High School, was named Sun Valley Fire Department's Firefighter of the Year. "Firefighter of the Year is someone who embodies what we do professionally all year round," said Chief Jeff Carnes. "He needs to come to the calls, come to the drills, show himself in the community as an upstanding citizen, be a firefighter all the time. Taan fits right into that. He's taken every class that's available, he's an emergency medical technician and he also works for Air St. Luke's. He's an all-around good kid." The Sun Valley Fire Department relies almost exclusively on its 25-member volunteer squad. "Without the paid-on-call volunteers, we wouldn't have an organization," said Carnes. "I've been on the department for 38 years and it's the way it's always been and always will be. Probably 85 per cent of the fire departments in Idaho work this way." David Rendahl, 56, was named Wood River Fire & Rescue's Firefighter of the Year. A three-year volunteer for Wood River, Rendahl started out with the Carey Fire Department in 2004. "I was coerced into the Fire Department," said Rendahl, who lives on Baseline Road in the Bellevue Triangle. "I was told my insurance would go up if they didn't man the Gannett station. But now I really enjoy it, it's so much better than the 32 years of construction that I put in. I wish I had started 30 years ago." "David's been really, really been helpful to the entire department this year by instructing upwards of 60 hours for our new recruits," said Chief Bart Lassman. "He's gained a lot of respect from the paid-on-call volunteers and the full-time firefighters as a leader and educator." "I am honored beyond belief," Rendahl said of the award. "I didn't expect it in any way shape or form. There's so many good people on this department and I am truly honored."